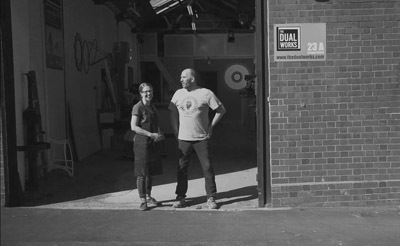 The Dual Wo rks is a shared creative studio situated at 23A Kenyon Street, in the heart of the Jewellery Quarter established in 2015 by two founding members Zoe Robertson and Steve Snell. This duo are practicing artisans who have a combined teaching experience within design education of over forty years. Together they work on their own design projects, undertake commissions and enjoy working collaboratively. They have over fifty years of combined making experience, across various industries, techniques and materials. Steve’s skills span carpentry, metalsmithing and plastic techniques to name but a few. These skills have been acquired though a lifetime’s passion for taking things apart, and learning how objects are made, then remaking into something new! Alongside this he has been employed as a 3D specialist in various Universities and Companies managing workshops dedicated to wood, metal and plastic processes, helping students bring their ideas to fruition where in-depth problem solving is fundamental to the realisation of products. Zoe is an award-winning designer maker who skills span a breadth of materials and processes. She enjoys the making process and describes herself as a ‘Blue Peter Girl’ where she was introduced to making things via this cult children’s television show back in the 1980’s! She has acquired over 20 yrs. of educational experience, teaching students 3D skills in various Art Colleges and Universities across the UK. Currently she divides her time between being a practicing jewellery artist at The Dual Works and lecturing at the world-renowned School of Jewellery where she has been residence for the past 10 years. Cartercutts have expanded their activities and.